There are three versions one for a single cell and two for two cells. One LiPolymer cell with Sub-Micro connector weighs 3.9 grams. 3.7 Volt 140 mAh. One battery with two LiPolymer cells with BEC connector weighs ~8 grams. 7.4 Volt 140 mAh. 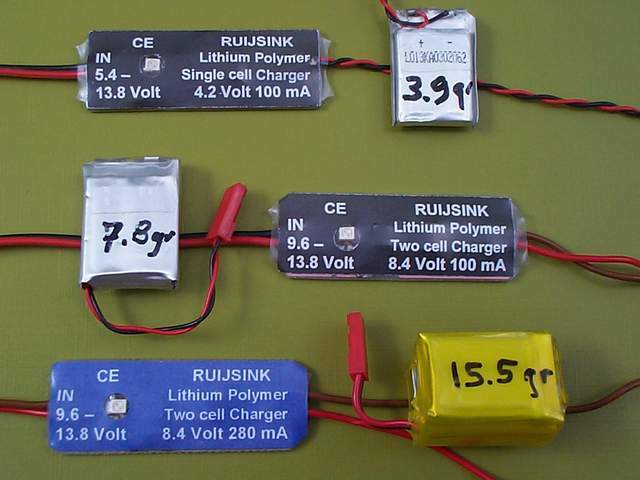 One battery with 2x2 LiPolymer cells with BEC connector weighs ~16 grams. 7.4 Volt 280 mAh. BEC style 2 pin "red" JST.